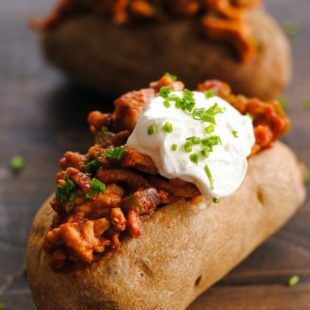 One of my favorite comfort food recipes is Rachael Ray’s Turkey Sloppy Joes. I don’t know how I found it, because I didn’t see it on TV. I’ve been making it for about nine years. I have the recipe memorized now, but I don’t measure anything and add and subtract ingredients as I please. The funny thing about the recipe is the disclaimer at the top “Note: This recipe method is written for children to follow, too. Adult helpers are referred to as GHs, or Grown Helpers.“ Apparently, this particular episode of Rachael’s show had kids helping grown ups in the kitchen. The recipe is written to address a child cook. All throughout the recipe, the recipe directs me to find my “Grown Helper” to help me with the tasks that involve a big knife. I’m reminded to wash my hands, and keep my fingers away from the small paring knife I’m trusted to use. It takes me a long time to memorize a recipe. For the first dozen times I made those sloppy joes, I got really tired of the Grown Helper shtick. I always thought “I should just copy and paste this into Word and get rid of all of that crap,” but of course, I never did. To this day, that recipe lives in my “keepers” binder, just waiting for my GH to join me in the kitchen and help me out. If you’re a grown person or even a reasonably competent child, you can prepare my homage to this ridiculous recipe. 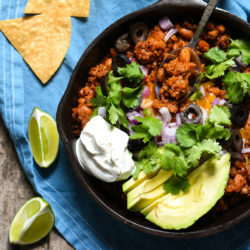 Here, I’ve made a lean ground chicken sloppy joe and flavored it up with smoky ancho chile powder, tangy tomato paste and umami-laden Worcestershire. Then, boom! I stuffed it in a potato! 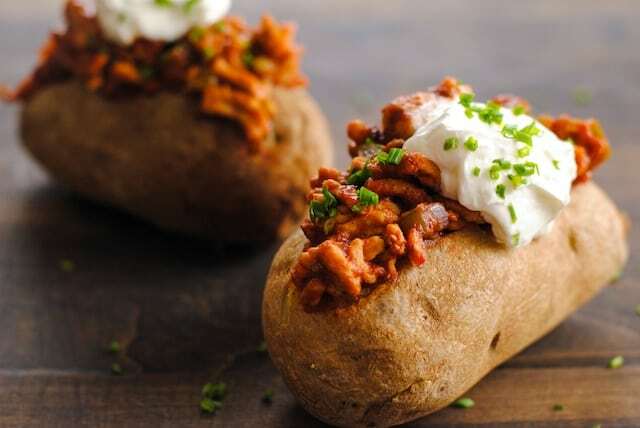 Lazy Cook’s Baked Potato: Use fork to poke several holes in each potato. Microwave potatoes on high 8 to 10 minutes or until tender. (Alternatively, if you’re non-lazy, potatoes can be baked in oven). Meanwhile, heat large skillet over medium-high heat. Add chicken, bell pepper and onion; cook 8 to 10 minutes or until chicken is cooked through, breaking up chicken with side of spoon. Reduce heat to medium; add tomato sauce, tomato paste, Worcestershire sauce, chile powder and black pepper. Simmer 3 to 5 minutes or until thickened. Slice off small portion of top of each potato. Use small spoon to scoop out some of potato flesh. 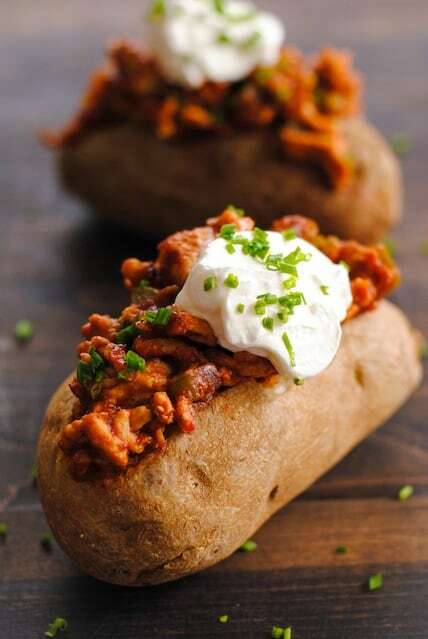 Spoon sloppy joe mixture into potatoes (Or, split each potato in half and top with sloppy joe mixture). 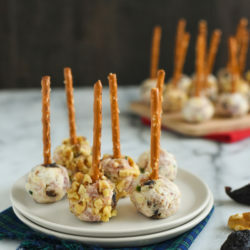 Serve garnished with sour cream and chives. The question at PicnicShop HQ though… Are they too sloppy for picnics? We reckon the mess would be worth it! This is a genius idea and right up my alley. Pinning, can’t wait to try this! Thanks Pamela, so glad you like it! 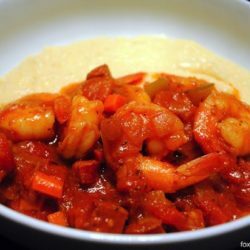 I saw this on FG and I couldn’t believe how similar it was to my own recipe that I was scrolling (way) down to. So I came over to see who I shared a brain with! I am so glad to know about you Lori. Your writing is great and what pretty photos. Subscribing! 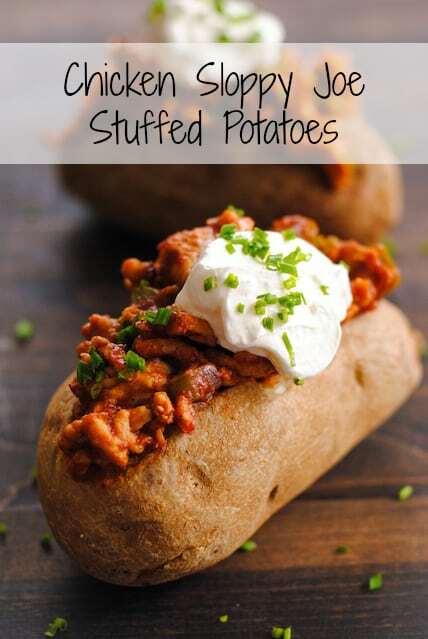 Anything “STUFFED” is always a win in my book! In my book,too 🙂 Thanks Chung-Ah!